On 20 Oct. 2014, the Training Course for Emerging Infectious Diseases and Biosafety Management was held in WIV, CAS, for the sake of improving the managerial and technological capability of emerging infectious diseases and biosafety management of the institute. Over 180 stuff members from managerial, scientific, and support offices participated in the training course. As a part of further education under the guidance of the institute’s strategic planning, the training course, which centers on biosafety and biotechnology development, the spread, prevention and control of emerging infectious diseases, and laboratory safety management, touches upon four topics, including macro-biosafety laws and regulations, the scientific popularization, diagnostic and prevention and control strategies of emerging infectious diseases, biosafety management and operation norms in the laboratory, and network information security of the institute. 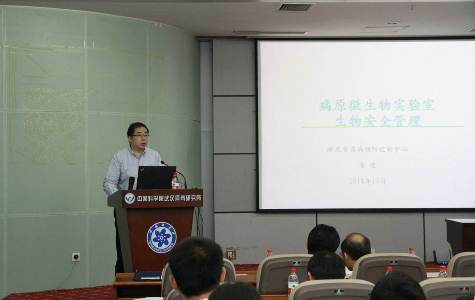 During the training, the biosafety academic symposium of the institute was held, on which the development strategies of biosafety system, the framework of biosafety education and training of the institute, and biosafety training plan of the institute were discussed in depth. The symposium put an emphasis on the importance of biosafety training, set up the draft of biosafety training outline, and put forward constructive suggestions for biosafety management and systematic training of the institute. WIV will continue to promote biosafety training, striving to grow to be the world-renowed base for specialized technology training and S&T service.